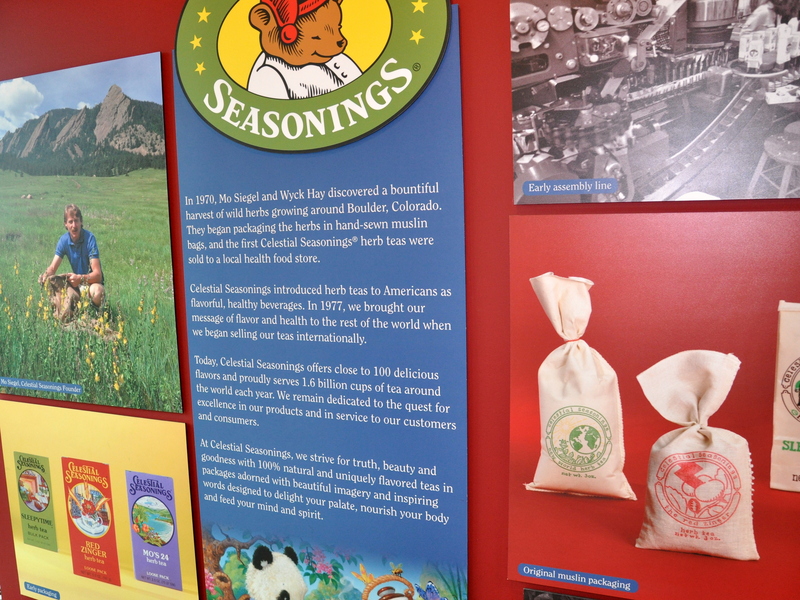 We toured the Celestial Seasonings factory in Boulder on our recent visit. 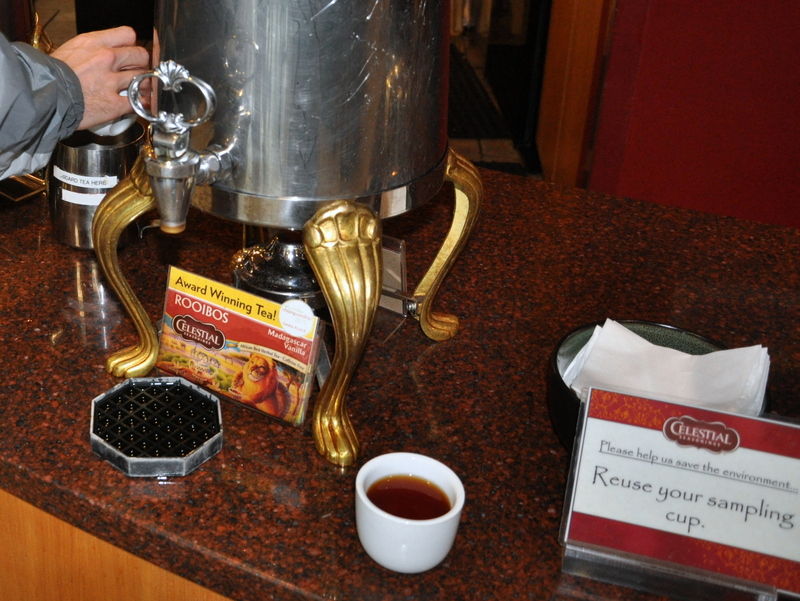 The tour is free and includes the opportunity to sample several hot and iced teas. It was raining the entire time we were there, making it all the more delicious. There is nothing quite like hot tea on a rainy day, especially when there’s a fun tour in the mix as well. I grew up drinking black tea, mostly Red Rose Tea, a Canadian brand dating back more than a century. My dad drank tea, so of course my sister and I wanted to drink tea, too. Mom on the other hand drank black, instant coffee. [Shudder]. Over the years I switched from black tea with milk and sugar to tea with just sugar. 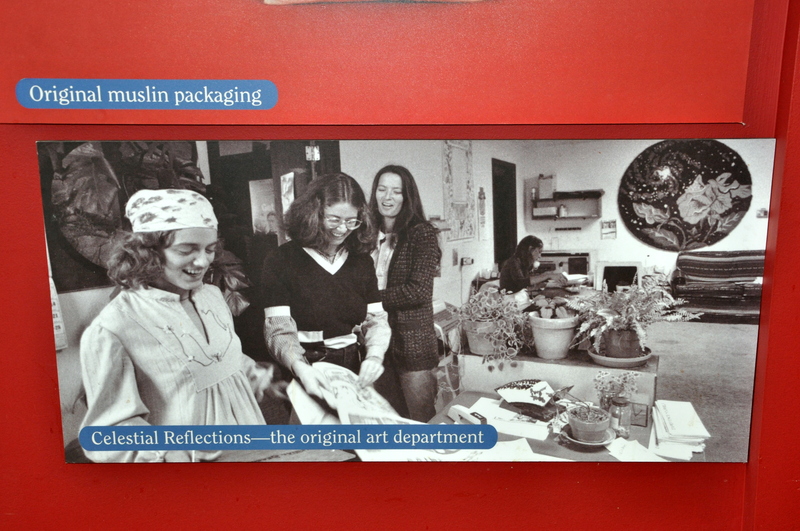 Then Celestial Seasonings came along in the seventies, and I was an herbal convert. The tour guide pointed out that 80% of what they produce is not actually tea, but an herbal infusion. It’s all “tea” to me, and I’m happy to consume green, Jasmine, Rooibos, also know as redbush, and vanilla flavored herbals. As factories go, Celestial Seasonings is small. They have a simple assembly line, along with pallets of herbs and spices stacked floor to ceiling. I also loved the fact that the equipment used for packaging the tea dates back to the forties. They essentially recycled an assembly line once used for packing cereal. There is one special room set aside for peppermint and spearmint. The mint is quite potent, and would quickly infuse all the other ingredients if stored together. The moment you walk into the room your eyes water and your sinuses open. It was quite an experience. It’s no wonder mint tea is so good when you have a cold. One of the things I liked when the teas first hit the market, were the pretty designs on the package along with an inspiring quote. Sleepy Time was the first of two herbal blends, and remains the most popular around the world. The “ticket” for the tour is a twin package of tea bags. There are several urns of brewed tea in the tea room. You’re issued a small ceramic mug when you walk in the door, and you’re free to sample as many and as often as you like. 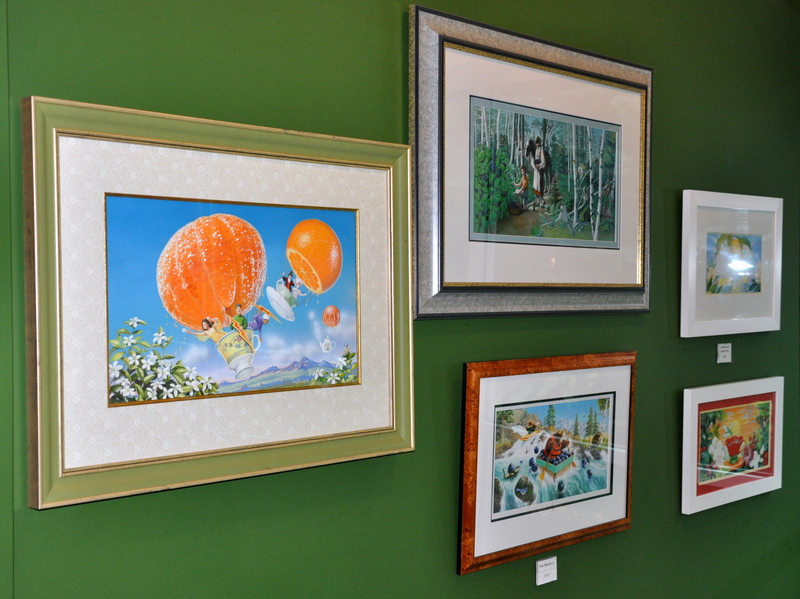 The tea room is also an art gallery, featuring several of the artists who’ve designed the clever packages over the years. You can pose with the Sleepy Time Bear, or nip in to the mythical scene from the original packaging. Like any self-respecting enterprise, the factory tour exits via the gift shop. You’ll get no complaints from me, though. They sell art, greeting cards, tea of course, herbal lotions, and postcards. It was a perfectly wonderful afternoon in every way. From their website: Celestial Seasonings was founded more than 40 years ago with one goal: to provide delicious, high quality teas that are good for our customers and good for the world. We think it’s important to share with you the steps we take to ensure that our teas are of the highest quality, deliver the great taste you expect and are produced in a way that protects the Earth’s natural resources. Celestial Seasonings and our parent company, Hain Celestial, stands up as leaders on important topics such as GMO labeling, sodium and sugar intake and animal welfare. We want to offer the best products and help our consumers make the best choices for themselves and their families. We call our sustainability story “Blended With Care: From Seed to Sip”, and we’d like to take you through it in eight steps – from the farmers’ fields to your teacup. You can read more on their website. So are you a tea drinker? Please let me know via the poll below. This entry was posted in Personal Essays and tagged Boulder Colorado, Celestial Seasonings, herbal infusions, rainy days, Sleepy Time Tea, Tea, travel. Bookmark the permalink. Kate, I loved reading the contents of your “brown beverage” shelf. You made me smile. 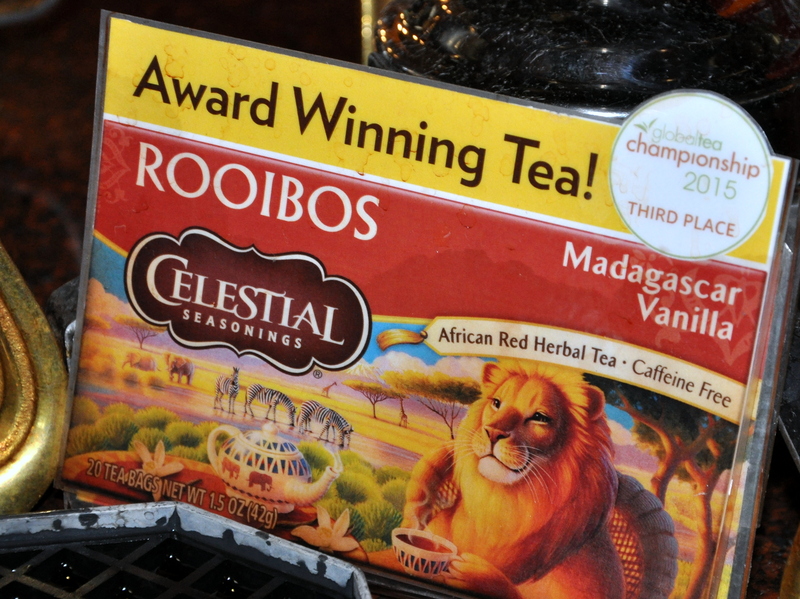 I discovered Rooibos when our book club read one of the Alexander McCall Smith books many years ago. It’s been my favorite since. We have a fairly new tea shop one town over where I like to buy my loose tea. She has several Rooibos varieties. Yum! I too kept instant coffee in the house for my mom when she was alive. It was a beverage of their time. I had to give up wine tours years ago (gives me migraines) but a tea tour would be right up my alley; I didn’t know one even existed! I’m not a regular tea drinker except in the winter. I love Celestial Seasonings, in fact that’s the only tea I drink. What a cool little factory. I’ve always liked their boxes. Hi Karen, The boxes are wonderful. It’s what attracted me to their tea all those years ago. It was fun seeing some of the original art on the walls. I’m glad you enjoy tea in the winter. That is true for most people, making it a challenge for this kind of business during the off season. 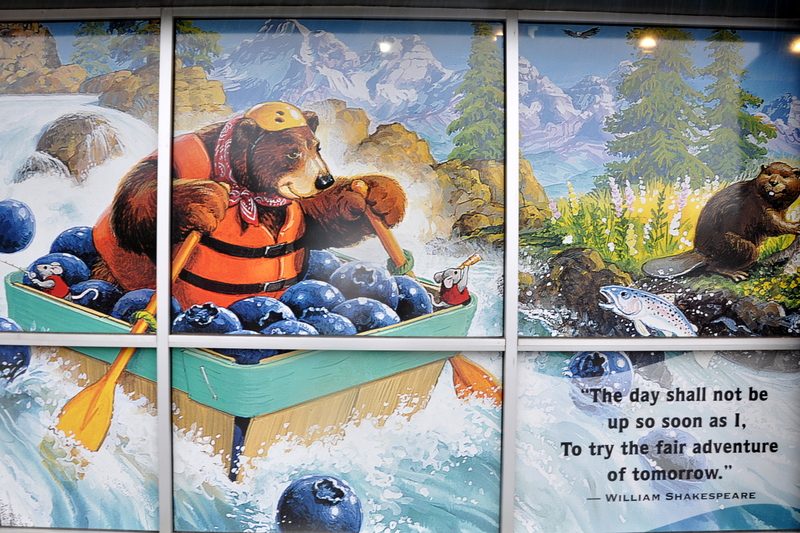 The same holds true, I suppose, for ski outfitters, Christmas tree growers and the like. I’m quite happy to drink tea or coffee. My daughter took me to a darling local coffee farm on Oahu that I fell in love with but they had tea too so anyone could be happy there. It was a great place to while away some hours though we only stayed long enough to brew and browse then it was off to the beach because I mean HAWAII!! LOL, Amy. 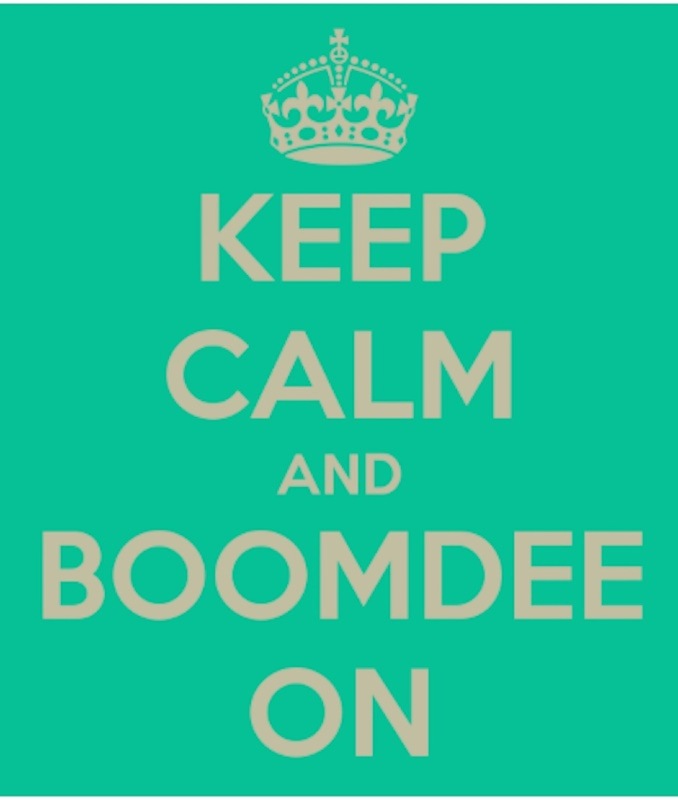 Yes…Hawaii and the beach are synonymous for sure. I’m so glad you found a fun little coffee farm on your travels. Oh, that smell. Nothing like it. I am actually more of a coffee drinker but especially since growing my own herbs, I’ve got more into tea – so much variety and more interesting than water, for sure! I like that term, Helen “have a nosy”. That’s exactly what it feels like. Herbs are so powerful. Along with coffee, teas and herbals have remained a staple in cultures for many centuries. It’s fascinating. Yes, I was reading in a book of fiction about c. 1320 here about a man using mint leaves for tea. Now, I hadn’t known they did that then but it seems realistic really! Dawn, I’m not the least bit surprised to read that you have Celestial Seasonings tea on your shelf. I hope you make it to Boulder one day. 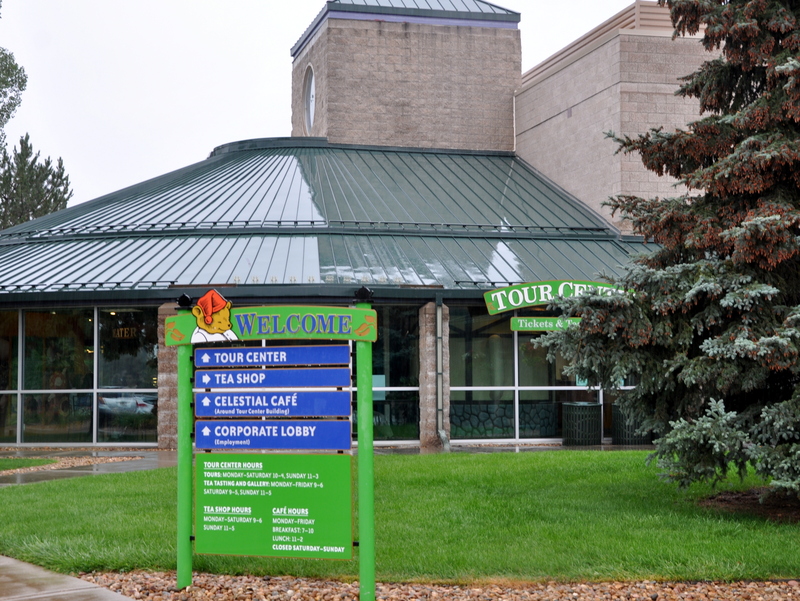 It’s a delightful place full of great shops and lovely restaurants and the beautiful Rockies on your doorstep. And tea of course! I love that you invite friends to make an herbal tea from your garden. I’m growing two kinds of mint and chamomile, but never think to experiment with it for tea. I must be more brave. I was a huge Earl Grey fan as well for years. It has the most wonderful aroma. My husband is a coffee guy. He bought a restaurant grade coffee machine from eBay in terrible condition, then refurbished it for home. He also grinds his own beans. I can smell coffee all day long, but I never acquired a taste for it. !! This probably was like Tea Nirvana for you. I had no idea Celestial Tea came from Boulder CO. The artwork was always what drew me to the packaging. I used to always have it on hand because my Ex-mom-inlaw Betty, an English girl, loved her tea. Neither Jim or I drink tea, but I do keep a small canister of Tetley in the pantry for guests. I guess it’s English Breakfast by Twilings but I also enjoy Earl Grey and sometimes Ruby Red. Is that a real kitty in the Tea Room? Mike loves his coffee too, and only drinks tea if he’s sick. There are a couple of medicinal teas (Throat Coat is one) and they really taste good when you’re congested. I think the brand is Traditional Medicinals. I’ve observed that those of us that really love our tea (or coffee, or wine) are usually particular about the taste. Do you remember the scene in the movie “Elf” where Will Ferrell brings Zoe Daschenal to a coffee shop that says “Best Coffee in the World”. He has her close her eyes and she says “this tastes like a crappy cup of coffee,” and he says “No…open your eyes.” I love that silly movie. Sorry hon, I actually never saw ‘Elf’. Unfortunately, I find Will Ferrell too manic to watch or listen too. He reminds me of Robin Williams. I couldn’t take too much of him either. He’s so out there or ‘on’ or something. I seem to like subtle humour. Maybe even stuff people don’t find funny at all. Like the mom on Downton. It was all in the look with her. But I think I’m in the minority and most people love that movie. I’m a weirdo. You are not a weirdo, or if you are, then I’m one too. Will Ferrell does a lot that I don’t like, but I’ve always loved the heart of the movie Elf. I watch it once a year at the holidays and it always makes me smile. Ed Asner is in it too as Santa and Bob Newhart plays an adopted dad. Do you have a favorite Christmas show or special from your childhood? I also love Bill Murray and remember Ground Hog Day well. I’ve even glimpsed him a few times on the golf circuit, hamming it up for the cameras. What a character. Did you see the Bob Newhart episodes on The Big Bang Theory? I loved all the Bob Hope movies as a kid. I also loved all the synchronized swimming movies and anything with Debbie Reynolds, Fred Astaire or Cary Grant. I did see Bob Newhart on Big Bang! He’s still got it. He was on Conan just a bit ago too. Cary Grant was my favourite 50’s movie man. His sense of humour was always mixed in there. Even if it were a drama. I love tea, and I especially enjoy trying all the blends our local tea houses and vendors have created – so many creative, tasty ones! 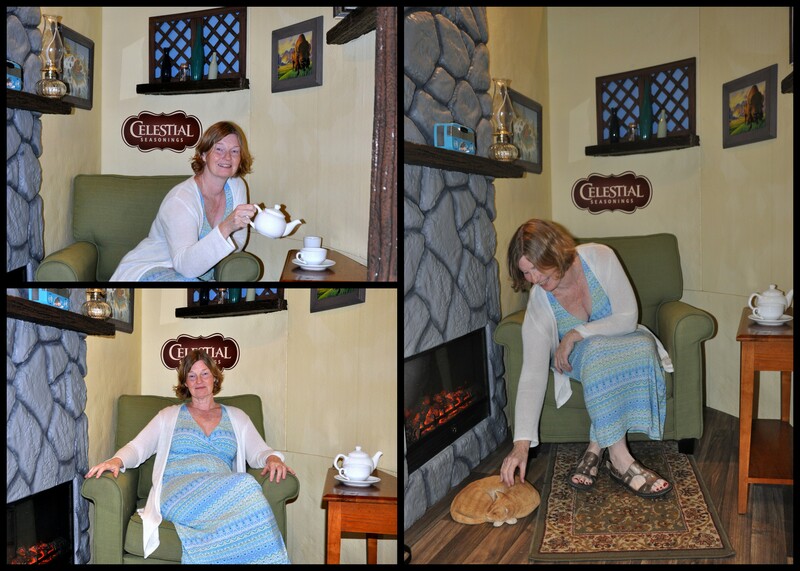 How fun for you to tour the Celestial Seasonings factory – if I ever get to Boulder, it’s on my list of must-sees! We too have a local tea shop creating different blends. It’s amazing once you get used to drinking loose teas how much more robust and flavorful they are. I hope you make it to Boulder. You would thoroughly enjoy the experience. That’s a very true observation about loose teas – I completely agree! Thank you, Sheryl. I could do with out this heat (101 here in San Jose today) but my husband is back home from his 12 day business trip, so we’re enjoying just being home together. I hope you’ve had a good weekend as well.